Today’s post includes two passing drills. The videos are hosted on You Tube. You will need to be on a network that allows you to access that site. University of Toledo head coach, Tod Kowalczyk, adopted this passing drill from Thad Matta at Ohio State. In the drill, players must pass the ball continuously for 35 seconds in the half court without dropping it or making a bad pass. 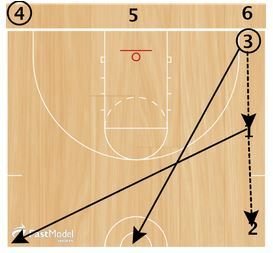 This drill is similar to the Argentine Passing Drill. The difference is that Argentine passing involves 8 players, and Perfect Passing involves 6 players. Editor’s Note from Brian: In the video, Tod mentions that that college shot clock is 35 seconds. The video was shot prior to the shot clock being changed to 30 seconds. You can set the time for whatever fits your needs. I know that this is the first time that Coach Cole has worked with these players, so the demonstration is not as good as it would be with her players. I know that a lot of these passes are not game-like, but you can work with your players to make the drill more game-like. What I do like about the drill is the concept of moving the defenders bodies, hands, and eyes with pass fakes. 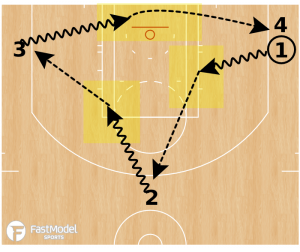 This passing drill was contributed by Mike Shaughnessy to the FastModel Sports Basketball Plays and Drills Library. Mike is a Player Development Coach for Dr1ven Training LLC. Attack kill spots on the floor (highlighted) that breakdown defenses, opening up drive and kick opportunities. Pass and rotate to the next spot. Go for a certain amount of (perfect) passes (and catches) before going the other way. Hold players accountable for communication and having hands ready to receive the pass. This post contains several videos from Howard Garfinkel’s 2014 Basketball Coaching Clinic. All videos are You Tube videos. Make sure that you are on a server that allows You Tube access. 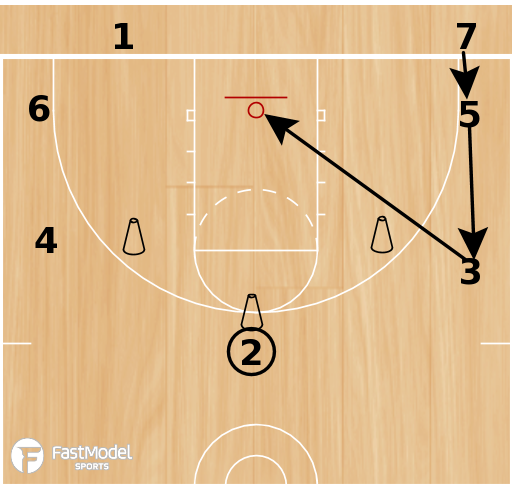 A shooting drill to work on the extra pass concept with a few extra wrinkles to make it more game-like a couple of minutes into the video. A play to run when your opponent is attempting to keep the ball out of your point guard’s hands. Short segment from Billy Donovan on working to make the inbounds press against a press tough. This drill was contributed by Coach Lason Perkins. He has worked at the high school, college, and semi-pro level for over 20 years. He has also created over 20 instructional DVDs and 5 books on basketball offenses. He has built a reputation for being an expert on international offenses and styles of play. Tiger Passing is a drill that can be used to work on passing, cutting, and being strong with the basketball. 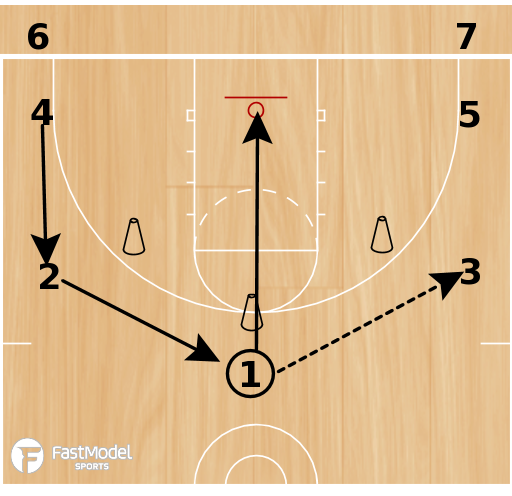 For teams that like to run Open Post offense, it also works on the offensive concepts. Line in each corner, cones are coaches/managers with blocking pads. to pressure receivers: Pass and cut, catch and face, cut to the rim. 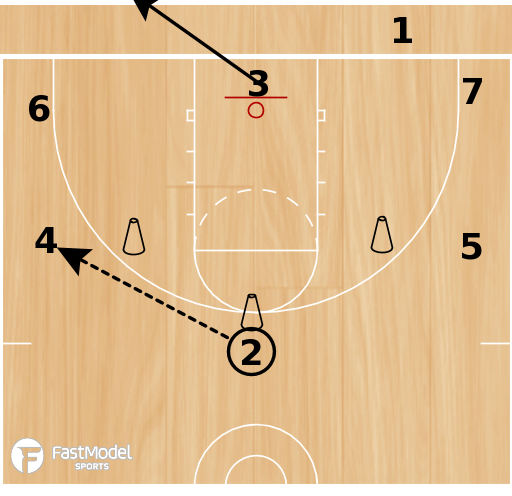 Cutter must sprint to fill the 5 spots (corner, wing, top). Basket cut must be made all the way to the rim. First player in line steps onto the court when the corner spot opens. Can run for designated number of passes or for time. Also works as a conditioner. 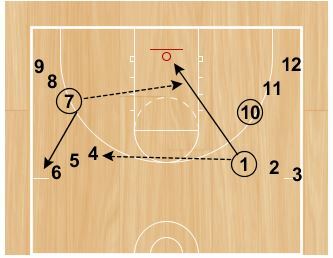 This is a passing drill that Coach Mike Neighbors used at the University of Washington. That is why he called it “Dawg” passing. He is now at Arkansas, so maybe it is “Hawg” passing now. There are two versions on this post. The first version is a diagram that includes layups and the second version is a passing and catching only version (You Tube Video). Coach Neighbors has a newsletter that is the longest running one that I know of. If you would like to be added to it, please let me know and I will pass along your email address to him. This is a drill that is fast moving and requires communication. Players 1, 7, and 10 start with basketballs. 1 passes to the line directly across from her to player 4. 1 then cuts on diagonal to receive pass from front of bottom opposite line (player 7) which she takes in for a layup. After 7 passes to 1, 7 goes to the end of the line behind where 6 is. 1 gets her own rebound, passes the ball to 8 (the same line that passed to her for the layup) and goes to back of line where pass came from–behind player 9. The top basketball is now on the opposite side with player 4. The drill now repeats itself from this side with the passes and cuts being the same. You can make it competitive by timing to see how long you can go without bad passes, drops, or missed layups. Or, you can split into two ends and set a time counting completed passes and made layups. 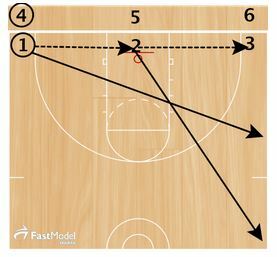 This is a You Tube video (without sound) of the above drill without shooting layups. Click the play arrow to see the video. 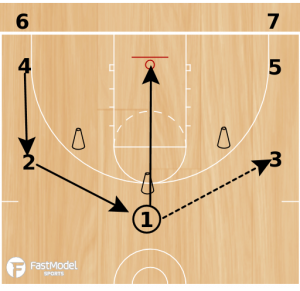 These basketball passing drills were posted in the FastModel Sports Basketball Plays and Drills Library The site has thousands of drills and plays that have been submitted by coaches from all levels and from all over the world. The drills can be used as warmup drills at the start of practice or as conditioning with a ball drills at the end of practice. You can time them and add a perfect passing and catching requirement to add an extra dimension of competition. This drill was contributed by Kyle Gilreath. 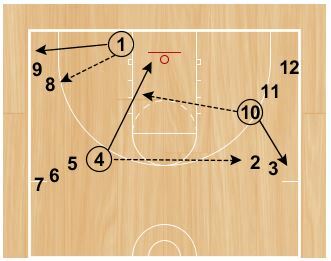 1 hits 2, 2 passes back and advances ball up to 3 for a lay-up. (All chest passes and No dribbling). 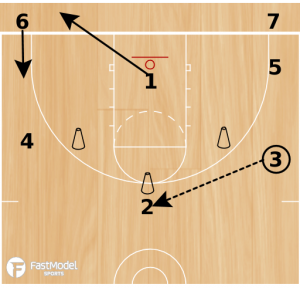 2 hits 3, 3 passes back to 2 who advances the ball up to 1 who is sprinting for a lay-up. 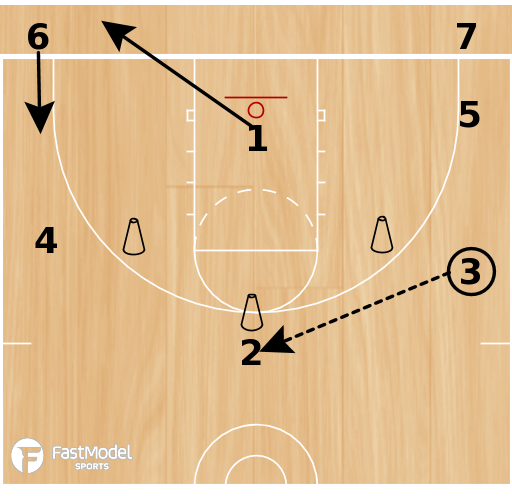 Waiting 4 gets rebounds OUT OF NET and continues the drill until they make the 14 (# players on team). Switch sides to make 28, any misses start all over. This drill was submitted by Greg White. Coach White has 14 years experience coaching basketball as a head coach from junior high, senior high and AAU teams in his home state of Arkansas. 1 passes to 2 then sprints to sideline. 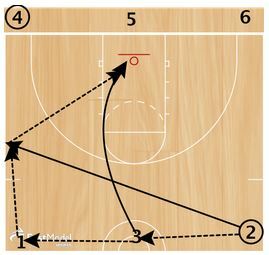 3 passes to 1 then sprints to mid court. 1 passes to 2 then sprints to corner. 2 passes to 3 then sprints to sideline. 3 passes to 1 who passes to 2 then passes to 3 for the layup.